Many people skip their workouts when they travel. It’s actually a really great excuse to slack off but it can truly be a time to give your body a break as well. However, let’s assume that most people really just use it as an excuse. I have heard and thought many times myself about how terrible the equipment is in the hotel “gym”. They call it a gym but it really is a treadmill and a universal weight machine with one pin (if you are lucky) for adjusting the weight for all the exercises. You know what though? In reality you don’t need a gym, you don’t even need weights! You really just need your body and the right attitude and you can do a tabata workout anywhere! So whether you are on the road for business, on vacation, or just can’t get to the gym, there is never an excuse to avoid a good workout. 30 Seconds of Non-Stop Crunches (shoulders off of the floor mid-way don’t cheat and sit all the way up). 30 Seconds of Non-Stop Push-Ups (all the way down and back up – legs down only if you gas out). 10 Seconds Resting in a Work Position (hold yourself up arms and legs so just the hands and tips of your feet touch the ground). 30 Seconds of Non-Stop Squats (squat until your bottom is almost touching the back of your legs). 10 Seconds Resting in a Work Position (hold the squat mid-way down). In 15 minutes you will have gotten your sweat on. If you didn’t then you need to work harder (do more crunches, push-ups, and squats in the working periods). You can also do 4 instead of 3 of each round (so 8 total for each exercise instead of 6). If that still doesn’t work then make the periods longer. If that still doesn’t work then there is a chance you are superhuman. So, you are thinking this is neat and all but how do I keep track of the time for this little workout routine? 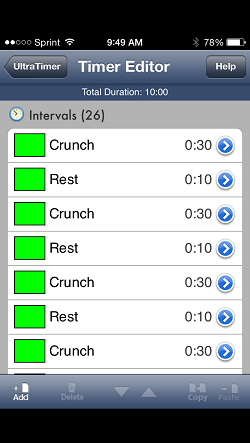 I personally use my iPhone and an application called UltraTimer (http://www.plainandsimplesoftware.com/Plain_And_Simple_Software/UltraTimer.html) to setup my tabata workout. I like this one because I can easily record my voice telling me what to do throughout the workout. With that said there are many tabata timers available for iOS and Android users if you search the respective app stores. You will easily be able to find one that will make working out anywhere using a tabata possible.